This page is for the original game. 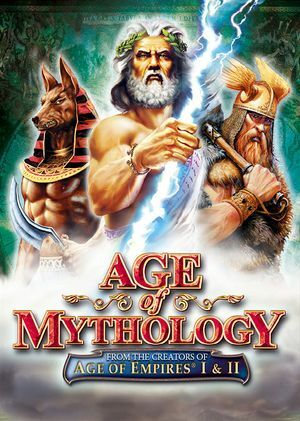 For the remake, see Age of Mythology: Extended Edition. Age of Mythology on TheGameEngine.org - solving some technical issues. SafeDisc v2 DRM[Note 1]. Gold Edition is DRM-free. 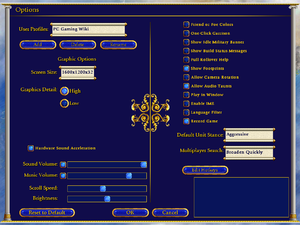 No-CD patches are already applied; the DVD is only necessary for installation - ensuring compatibility with modern OSes; and all games are already fully patched. Note that a patch is needed to fix some issues here. The game has an autopatch feature which can be accessed through the setup program, a Start Menu shortcut or in-game. Limited choice in resolutions; see Widescreen resolution. See Borderless fullscreen windowed. Skipping intro is recommended. Launch the game and change the resolution to anything else. Use the xres=YourWidth yres=YourHeight command line argument. If the resolution doesn't apply try launching the game a few more times or change any video settings. ↑ 2.0 2.1 2.2 When running this game without Administrator elevation, activity in %PROGRAMFILES%, %PROGRAMFILES(X86)%, and %WINDIR% might be redirected to %LOCALAPPDATA%\VirtualStore\ (more details).